→Can Whey Protein Make You Gain Weight, or Even Fat? Time to Bust a Myth! Can Whey Protein Make You Fat or Gain Weight? Whey protein is the protein type that is isolated from whey, a watery substance that is a by-product of the cheese making process. It’s considered a complete protein that contains all 9 essential amino acids. Depending on the type of whey protein (see further below), it is also low in lactose. It’s often marketed as a food supplement to improve athletic performance, especially weight lifting and body building. Whey protein is also often used as a milk replacement, because milk contains lactose and casein, and is therefore suitable for people with lactose intolerance. There are quite a lot of different types of foods that contain some level of whey protein, so you don’t always need to rely on supplements. All types of cheeses contain some level of whey protein because of the milk processing. Ricotta cheese has one of the highest amounts, around 28 grams per cup. Milk contains both casein (slow-digesting) and whey protein (fast-digesting). Milk is also high in lactose and can cause gastrointestinal discomfort or other allergic reactions. Yogurt comes from milk and therefore contains whey protein. Yogurt also contains probiotics that keep the bacteria in your gut healthy. Make sure you get plain yogurt or Greek yogurt for the best health benefits. Plain yogurt contains around 12 grams protein and Greek yogurt up to 20 grams per cup. >> Check out my favorite vegan sources of protein. There are in fact different types of whey protein, each with their own benefits, quality levels and price tags. This is the most standard type of whey protein that contains a high percentage of lactose (between 4 and 50%). The percentage of protein is between 25 and 90%, depending on the product. WPC is ideal for those who are just starting out with protein supplements and want to see how it helps with their workouts and overall health. This type of whey protein is the purest form that contains no lactose. The percentage of protein in WPI is between 90 and 95%. WPI is usually more expensive than WPC, but the quality is better and it absorbs quicker than WPC. WPI is also ideal for those who are lactose intolerant. Hydrolysed whey protein is the most sophisticated and usually most expensive protein supplement available. WPH contains peptides (protein chains) that are more easily absorb-able, even more so than with WPI. It can however contain a small percentage of lactose. If your lifestyle requires additional whey protein intake, I would always recommend to go as clean as possible. Lots of protein supplements are loaded with nasty extras to make things taste better and to keep the production process as cheap as possible. Stick to reputable protein supplement brands and take a very good look at the label. 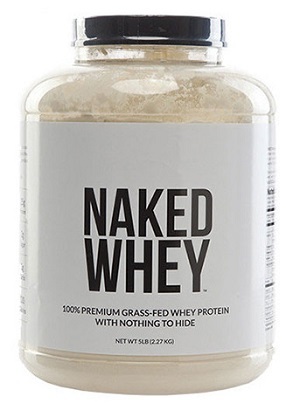 A brand that I would highly recommend is Naked Nutrition. The name is pretty self-explanatory. Naked Nutrition prides itself in manufacturing clean products with only the purest ingredients. They not only strip out unnecessary – and often nasty – ingredients, but they also stay clear from costly marketing campaigns. Instead they try and keep their products simple, the way they should be. If you buy protein supplements from Naked Nutrition then you’ll know exactly what you’re getting. The purest protein and nothing else. Their Grass Fed Whey Protein comes from dairy cows with a 100% grass-fed diet. The milk is non-GMO and free from any artificial or growth hormones. Grass-Fed protein is clean, pure and suitable for those that want to build lean muscle and speed up the recovery process after a workout. This whey protein supplement gives you 25 grams of protein and 5.9 grams of BCAA’s (Branched Chain Amino Acids) per serving. If you like a but more flavor, simply add some orange juice to your protein shake, or consider getting the vanilla flavored whey protein. 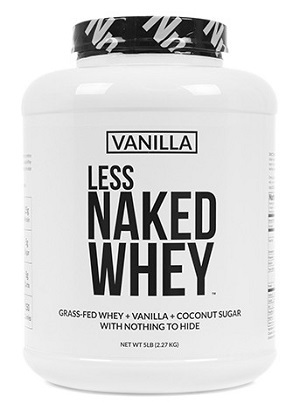 Their Grass Fed Vanilla Whey Protein is exactly the same, but comes with extra vanilla and organic coconut sugar. This protein is just as powerful as the pure grass-fed whey protein, except that it has a bit more flavor. Ideal for those that struggle to drink plain whey protein. >> check out our 6 favorite all natural whey protein powders. The main benefit of using (whey) protein is that it helps to increase muscle mass and improve athletic performance. Whey protein is a complete protein, which means that it contains all 9 essential amino acids. Essential amino acids cannot be produced by the human body and must therefore come from food we consume. Amino acids help us to perform better and build muscles faster. Whey protein has also been shown to increase bone density. According to this study, whey protein stimulates osteoblasts and helps activate the bone building process. Another surprising effect of whey protein is that it helps to reduce hunger. According to this study, consuming this type of protein results in a reduction of the hormone ghrelin, which is also referred to as the “hunger hormone”. When you consume too much whey protein, more than your body needs or more than your body can handle, this can lead to negative side effects. It is a misconception to believe that the more whey protein you consume, the more muscle mass you will build up. Unfortunately it doesn’t work that way. On average, a healthy person should consume around 0.8 grams of protein per kilogram of their body weight. When doing consistent strength training, this amount can be increased to 1 gram of protein per kilogram of their body weight. Professional weight lifters and body builders will consume much more than this but that is because their training regime requires such a big amount of protein. What are some of the potential side effects of consuming too much whey protein? Kidney stones are basically calcium deposits in you kidney that your body needs to get rid of (you need to pee them out). People on a low carb and high-protein diet may be more vulnerable to the development of kidney stones. You can prevent this with a balanced diet and moderate intake of whey protein. This appears to happen frequently, especially when you are just starting out with whey protein supplements. If you’re mixing whey protein with milk, maybe try water instead to reduce the irritation. This is also a side effect that appears to be common with people who take whey protein. It’s not something to worry about and it will eventually go away. Other commonly reported side effects are headaches, migraines, fatigue and loss of appetite. >> Check out my favorite high-protein smoothie recipes. Unlike whey, casein is a type of protein that your body breaks down very slowly, usually somewhere between 5 and 10 hours. Casein is therefore not very suitable as a supplement post-workout, because your body is in need of quick nutrients in that situation. Casein is often used as a meal replacement and because it breaks down slowly, it’s ideal to consume before going to bed. Other than that, casein and whey are very similar protein types. Both casein and whey come from dairy products. Soy protein is a great choice for those who are lactose intolerant or for vegans, as it’s completely plant-based. The downside of soy is that it’s heavily processed and often genetically modified. Just like whey protein, soy protein contains all of your essential amino acids and is therefore considered a complete protein. As the name suggests, hemp protein is derived from hemp (cannabis plant) seeds. While hemp protein is not a pure source of protein, it’s still considered a complete protein, rich in omega-3 and omega-6 fatty acids, perfect for vegetarians and vegans. It’s also an expensive protein powder as cannabis is not grown on a large scale and often needs to be imported. Hemp protein is still a relatively new product on the market. Yes, brown rice also contains protein. While brown rice protein is not a complete protein, it’s considered a healthy protein option, high in complex carbohydrates, vitamin B and fiber. Even peas contain protein. Pea protein powder is 100% plant-based and fat and cholesterol free, and it’s very affordable too. Pea protein, however, isn’t a complete protein so it should be paired with other protein sources. No, whey protein doesn’t make you fat. Whey protein itself will not make you fat or gain weight, because there is nothing in it that actively causes an increase in fat storage. Whey protein is simply a type of food, just like eggs, chicken and fish. Combined with a proper work-out regime, whey protein can certainly make you gain weight. But this is because your muscle mass is increasing and your body fat is decreasing, which can result in a net weight gain. Protein deficiency, on the other hand, can lead to weight loss but for all the wrong reasons. Protein deficiency will lead to muscle wastage because your body is trying to get protein from your muscles. This can then result in weight loss, but this is obviously not the type of weight loss you should aim for. Whey protein is an essential nutrient that plays an important part in a balanced diet. Protein helps to increase and maintain muscle mass and helps strengthen bones. Protein deficiency can cause major health issues. Moderation is key with everything and the same applies to whey protein. As a dietary supplement, whey protein works wonders for athletes, especially weight lifters and body builders, but over-consuming protein without a proper work-out regime will not do you any good and will not magically increase muscle mass. Whey protein will not make you fat, just like chicken, eggs and fish won’t make you fat. Even if you don’t do strength training, whey protein as a supplement can still benefit you when your regular diet doesn’t provide you with sufficient protein.